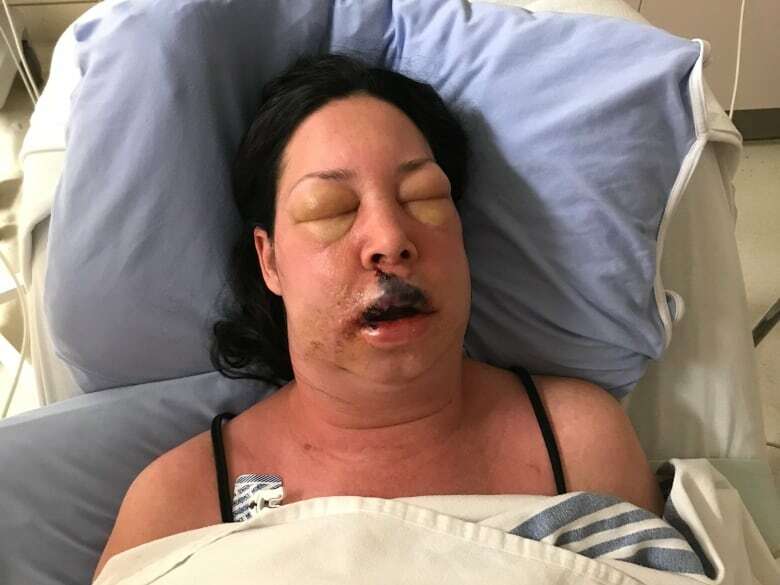 A woman from Legal, Alta is recovering in an Edmonton hospital after losing her lip to flesh-eating disease. Warning: this story contains a graphic image that may disturb some readers. An Edmonton-area woman feels fortunate to have only lost her upper lip after she contracted flesh-eating disease on Christmas Day. 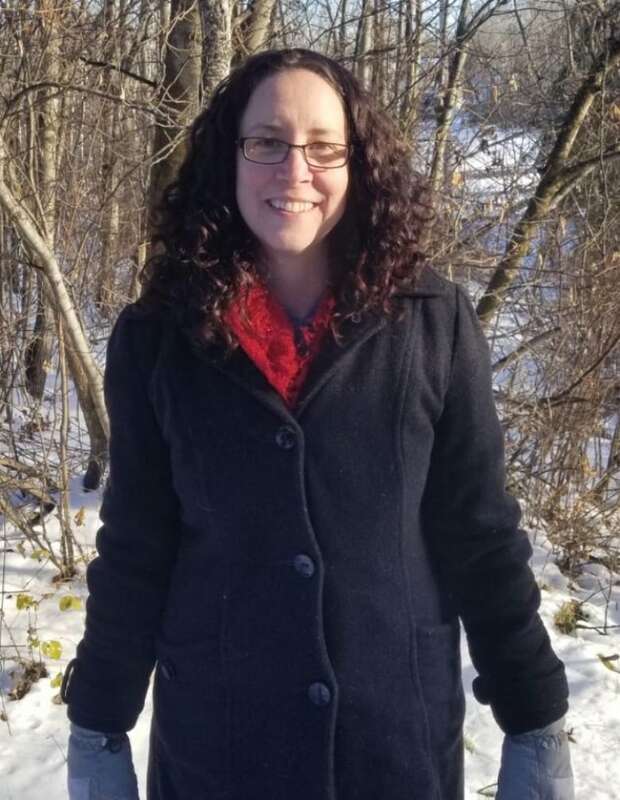 Anik Cormier, 40, of Legal, north of Edmonton, regained consciousness last week for the first time since she went to hospital Dec. 25 with swelling on her face. She was diagnosed with necrotizing fasciitis, more commonly known as flesh-eating disease. Surgeons removed her top lip and some of the cheek on the right side of her face. She has since had a skin graft to repair her lip, using skin from her leg. "She's lucky and we're very fortunate that she's still here," said Justin Cormier, Anik's husband. The couple were spending Christmas Day at home with their infant daughter when Anik first noticed the swelling. She didn't feel ill, but she and Justin thought they should be cautious so they visited a hospital to get it checked out. "I thought, 'I'll get meds or something, and I'll be home,'" Anik said. "Not a big deal. I didn't think it would turn into this." Over a couple of days in hospital, her face and neck swelled. Her eyes swelled shut. She was diagnosed with group A streptococcus bacteria, thought to be the most common cause of flesh-eating disease. "When I found out, it scared the crap out of me. It really did," said Justin. "Didn't really know what to do. Didn't know what to do with myself. [It was a] really, really stressful time." Anik was sedated and breathing through a tube for weeks while Justin worried if she would survive. Awake now for a week, and recovering at the University of Alberta Hospital, Anik is still being fed through a tube. "I've heard stories of people losing limbs and dying, and different things," she said. "I'm very fortunate." Group A streptococcus is a medical mystery. In March 2018, CBC News reported that cases are on the rise in Canada but public health experts don't know why. Part of Anik's face is covered with bandages as she recovers from her skin graft. She will eventually undergo reconstructive surgery, which might not be for another eight months or more. She's hoping to be released from hospital next week. As for how she ended up contracting the flesh-eating bacteria, the couple said doctors told them it was unclear. "They have no idea. They say it would have most likely gone through some sort of scratch, or wound of some kind," Justin said. "I mean, the Strep A bacteria itself is fairly common. "We were basically told we'll never really know." Anik hopes other people hear their story and react as quickly as they did if they ever notice a similar swelling. "Even if you feel fine, you need to seek medical attention because you never know what it is," she said. "I'm a healthy 40-year-old woman. It could happen to anybody." A GoFundMe page is raising money for costs associated with Anik's recovery.